You say potato, I say patahto. 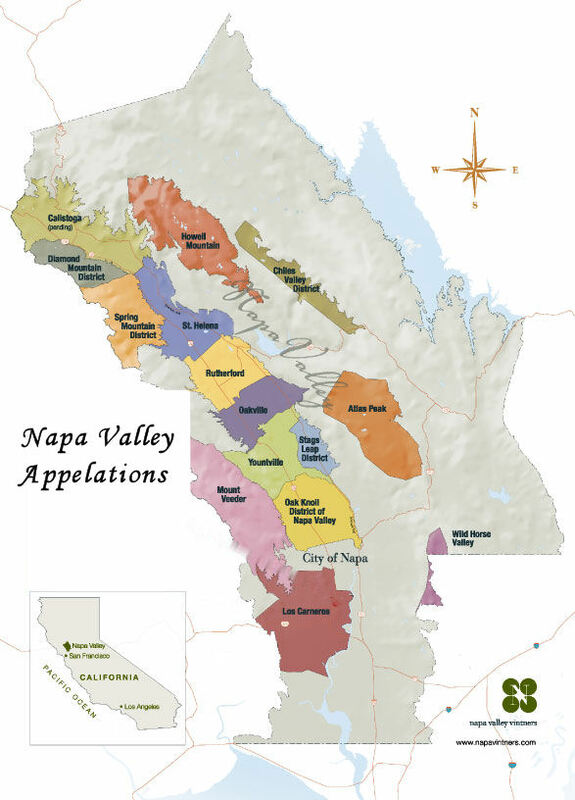 You say appellation I say American Viticultural Area. Whatever you call it, every serious wine producing country has one. It’s a recognition that those things that happen to a grape while it’s growing determine how wine tastes. I was with a winemaker the other evening and he said that what he does as a winemaker contributes only about 10% to the quality of the finished wine. The other 90% is determined by the characteristics of the grapes. It’s all about terroir. Terroir [tehr-WAHR] is French for "soil," but the word has come to mean much more in the vocabulary of wine. In wine terminology it refers not only to the type of soil the grapes are grown in (chalky, claylike, gravelly, sandy, etc.) but also to all other viticulture, geographic, climatic and environmental factors that influence the grapes while growing. While there is debate as to the degree of influence the grape’s terroir has on the wine, it is beyond question that grapes from some vineyards produce better wines than those same grape varieties grown in other, sometimes quite nearby, vineyards; all other things being equal. The concept of terroir is the basis for the old world concept of appellation; that is that wines from different regions can be distinctive and unique, independent of wine making technique. This concept of regional uniqueness has grown into the highly regulated European appellation systems that we are familiar with today, including such famous appellations as Champagne, Burgundy and Bordeaux in France, Chianti in Italy and Rioja in Spain. American Viticultural AreaIn the United States the terroir concept is reflected in our system of American Viticultural Areas (AVA) such as Stags Leap, Lodi, Paso Robles and Napa Valley. There are about 200 AVAs in the United States, with more than 60 of them in California. AVAs come in all sizes, the Texas Hill Country AVA contains approximately 15,000 square miles, while the Cole Ranch AVA, located in Mendocino California, covers less than a quarter of a square mile. Federal guidelines require that 85% of the grapes in a wine have to come from an AVA in order to use that AVA name on the bottle. California state guidelines are more stringent, requiring 100% of the grapes come from a California AVA before its name can be used on the bottle. Regardless of the actual term used in a particular country, the term appellation is generally accepted shorthand. Pay attention to the appellation when you find a wine you like. The odds are good that you may like wines made from the same grape, but produced by other makers within that same appellation.